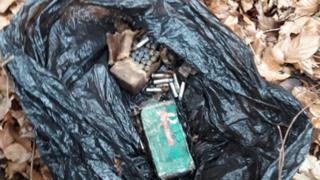 Gardaí (Irish police) have discovered explosives and firearms near the Irish border. Gardaí carried out the searches in County Louth as a follow-up operation on dissident republican activities. The Irish Army bomb disposal team was called out during the operation. Last month a suspected mortar tube and a "substantial quantity of ammunition" were recovered by Gardaí near the village of Omeath on the Cooley peninsula. Further searches were conducted an area close to Omeath on Thursday. In a statement, the Gardaí said they recovered "a quantity of explosives, two firearms and a sizable quantity of ammunition of various calibres." "An Explosive Ordinance Disposal unit of the Irish Defence Forces later visited the site and some of the material was later destroyed by a controlled explosion. "Investigations are ongoing and for operational reasons there will be no further comment."